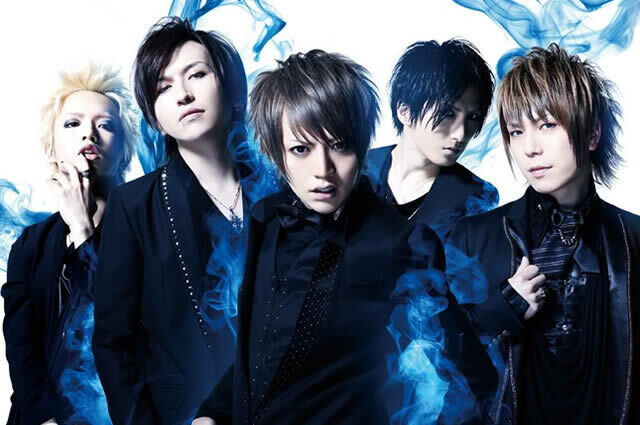 alice nine.’s line-up is the same as it was at their inception: Shou on vocals, Tora and Hiroto (ex-BAQUEPIA) on guitar, Saga (ex-Visage) on bass and Nao (ex-Fatima) on drums. Shou and Tora had previously been in the band Givuss together. Alice Nine was originally known as alice nine. until the name change in 2009. Shortly after forming, the band held their first live at Ikebukuro Cyber and continued to perform, and also participated in PS COMPANY presents: Tribal Arivall Vol.81 in June. The next month, they released their first maxi-single, Namae wa, imada muhi, which was limited to 1000 copies and sold out during its pre-order period. They released a second press of the single in August, this one limited to 3000 copies and it also sold out. During this time, they went on a short two-man tour with fellow indie band ayabie, with the sold-out tour finale taking place at Shibuya O-East. In September, the young band joined PS COMPANY and released their first mini-album shortly afterward. Like alice nine.’s previous releases, this one was also limited and did well, ranking third on the Oricon Indies chart. They also went on a second two-man tour, this time with Karen. This tour was much larger than their first with ayabie, and it took them all across the country for about a dozen shows. They continued to perform and ended their first year together at an event at Holiday Shinjuku. alice nine. kicked off 2005 by holding their first one-man live at Liquid Room Ebisu. They participated in a number of other events throughout February and March, including a live on Valentine’s Day at Electric Lady Land. In the next three months, they released three more singles and spent April performing as label-mate Kagrra,’s opening band during their 2005 tour. In June, they did another two-man tour with ayabie, this one much more extensive than their previous tour together, taking both bands across Japan. When July rolled around, alice nine. had just finished up their tour with ayabie and they hopped right back onto the tour buses to participate in PS COMPANY presents: Tribal Arivall Tour 2005 with Kra and bis, both PS COMPANY label-mates at the time. The band also released their second mini-album, ALICE IN WONDEЯLAND, on July 27th. After an exhausting summer, the band seemed to take a bit of a break in August and September, performing only once and doing various in-store events. As the temperature began to cool, however, alice nine. heated back up, performing at Shibuya O-West with Duel Jewel and Soroban in October before re-releasing several CDs, including a third press of their first single. When December came around, fans found alice nine. taking part in the massive Peace & Smile Carnival Tour, organized by PS COMPANY and featuring their artists. The band’s official fan club, club ALICE, also opened that month. In 2006, alice nine. rang in the new year with some new releases, including their first live DVD, ALICE IN WONDEЯ FILM, and three new singles, one of which was featured in the anime “Meine Liebe.” In April, alice nine. released their first full length album, Zekkeishoku. alice nine. took a brief rest over the summer, but fans weren’t left to wait for long as the group released their second DVD, which contained a short movie written by Tora as well as a music video and some behind-the-scenes footage. In October, they released an Internet-only single, Blue Planet, which required a Japanese credit card to access. They ended the year by performing at various events, including Beat Shuffle’s anniversary show held on December 30th. The band kicked off 2007 with a number of new releases, including a DVD, a new single and a photo book. Perhaps the most exciting news for their many international fans, however, was their participation in the Jrock Revolution event held in Los Angeles, California. After taking part in this multi-band event at the end of May, they continued to produce plenty of new music, including their second full album, Alpha. Early in 2008, the band made a shocking announcement via the members’ blogs. Due to an injury, a cervical disk hernia, sustained by Tora, the band was forced to postpone a number of lives as pain and numbness made playing nearly impossible for the guitarist. Though the band could not provide any solid information as to when the lives would continue, they kept fans updated and resumed activities in a relatively short amount of time. Their first single of the year, MIRROR BALL, was released on March 26th, with the title track being used in the live action movie adaptation of the anime “Aquarian Age.” That summer, they released two PV collection DVDs and continued their nearly non-stop pace with the release of their next single, RAINBOWS. Before the end of 2008, another single and their newest live DVD, DISCOTHEQUE play like “A” RAINBOWS-enter&exit- hit shelves. 2009 opened with PS COMPANY’s Peace & Smile Carnival, which had the band playing with their fellow label mates at Nippon Budokan to celebrate the label’s tenth anniversary. On January 14th, they released their newest album VANDALIZE, which came in third on the Oricon Charts daily and seventh for weekly. At the beginning of summer, they announced that the band would no longer use alice nine. or the kanji spelling officially and would use Alice Nine instead. The name change reflected the changes in the band’s direction and also made it easier for the media to refer to them. Their next single, titled Hana, is to be released in August along with a book, “Piece of 5ive elements “The Book” -Alice Nine 5th-,” which features interviews and photos in commemoration of the band’s five years of existence.